Europe in the Middle Ages had descended into a dark period, and none more so than in the field of medicine. The rich heritage of the pagan Greeks had largely been ignored or forgotten by medieval Europe, and instead it was the early Arabist world that embraced and developed the Hellenistic medical teachings, emerging not only as guardians of the classical learning still existent, but also as pioneers and innovators, restricted only by the development in the associated fields. The Kahhal (), or Oculist or Eye Specialist, had a privileged place in royal households, especially during the Abbasid period, in contrast to the time of Galen, whose writings referred to ophthalmologists in a rather derogatory manner. This elevated standing in the medical profession allowed Arabist scholars to cultivate remarkably erudite techniques and exceptional texts, which were used until very recently. Context: Dexamethasone Posterior-Segment Drug Delivery System is a novel, biodegradable, sustained-release drug delivery system (OZURDEX® ) for treatment of macular edema following retinal vein occlusion and posterior uveitis. However, its potential role in management of diabetic macular edema has not been reported yet. Aim: The aim was to evaluate the safety and efficacy of (OZURDEX® ) in patients with recalcitrant diabetic macular edema (DME). Setting and Design: A retrospective, interventional case series from a tertiary eye care center in India is presented. 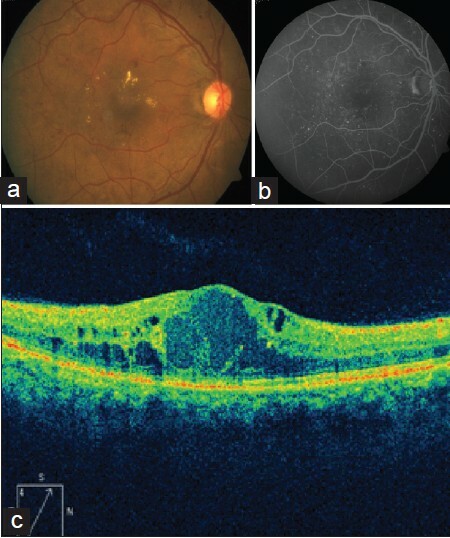 Inclusion criteria comprised patients presenting with recalcitrant DME, 3 or more months after one or more treatments of macular laser photocoagulation and/or intravitreal anti-vascular endothelial growth factor (VEGF) injections. 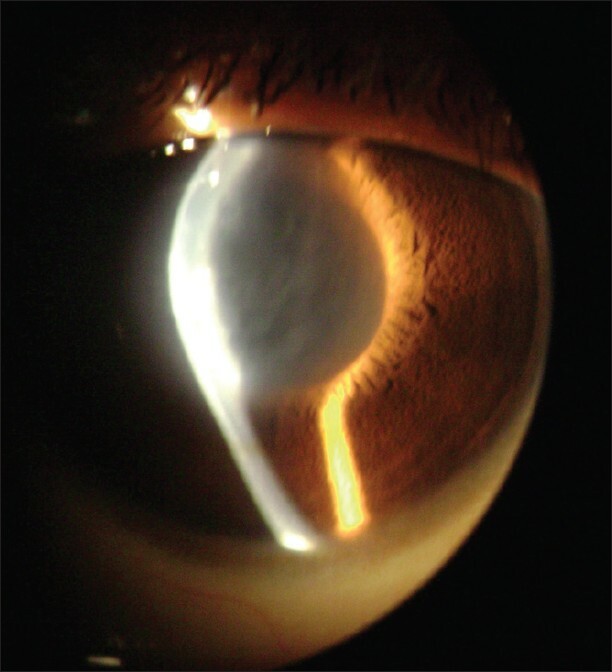 Exclusion criteria included history of corticosteroid-responsive intraocular pressure (IOP) rise, cataract extraction, or other intraocular surgery within 3 months. The main outcome measure was visual acuity at 1 and 4 months after OZURDEX® injection. Secondary outcome measures included change in central macular thickness on Optical coherence tomography (OCT) and changes in IOP following intravitreal OZURDEX® implant. Of 18 eyes (17 patients) with recalcitrant diabetic macular edema that underwent OZURDEX® implant, three eyes (two patients) had follow-up of more than 3 months post-injection. Results: Mean age of patients was 56 years. Mean duration of diabetes mellitus was 16.6 years. Systemic control of DM was good as assessed by FBS/PPBS and HbA1c. The pre-operative mean central macular thickness was 744.3 μm and improved to 144 and 570 μm at months 1 and 4, respectively. Preoperative mean BCVA was 0.6 logMAR units and improved to 0.3 and 0.46 logMAR units at month 1 and 4, respectively. The mean follow-up was 4.3 months (range 4-5 months). Conclusion: OZURDEX® appears efficacious in management of recalcitrant diabetic macular edema. The results of the ongoing POSURDEX® study will elaborate these effects better. Purpose: The purpose was to assess the safety and frequency of intraoperative complications of phacoemulsification using an in situ nuclear disassembly technique in pseudoexfoliation (PEX) cases. Setting: The work was done in Rustaq Hospital, Rustaq, Sultanate of Oman. 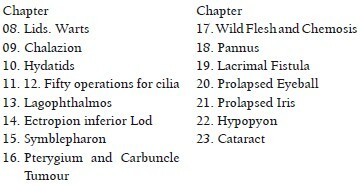 Materials and Methods: This prospective, interventional, noncomparative study included 103 cases of cataract with pseudoexfoliation that underwent phacoemulsification with in situ nuclear disassembly using Alcon Infinity machine with Ozil handpeice and Kelman-style 45° phacoemulsification tip. Results: Of the 103 cases, 55 males (53.4%) and 48 (46.6%) females, one case developed posterior capsular rupture, and four cases developed zonular dehiscence that was partial in three cases and >180° in one case only. The best corrected visual acuity (BCVA) 4 weeks postoperatively using logMAR notation was as follows: 66 cases (65.1%) had BCVA of 0.30 or better (logMAR notation), and 37 cases (35.9%) had BCVA of 0.48 or less. Conclusion: Safe and efficient phacoemulsification without nuclear rotation could be achieved in cases pseudoexfoliation in which zonular weakness is a concern by utilizing the versatility of Kelman style phaco tip to do lateral sweep sculpting and in situ cracking techniques. It prevents zonular stress by avoiding manipulation or rotation of the nucleus in cases. Background/Aim: Acuity charts that follow the principle of logarithmic size progression (logMAR charts) are considered to be the gold standard for the assessment of distant vision. But it is not well accepted for routine eye examinations due to increased testing time and the complexity of scoring. This study was designed to check whether a modified logMAR chart with three optotypes would provide a reliable acuity assessment compared to standard logMAR charts for routine eye examination. 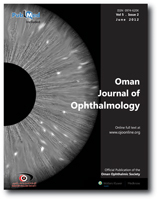 Materials and Methods: Two versions of modified and standard logMAR charts were designed, constructed, and used to assess the visual acuity of 50 individuals drawn from a typical out-patient population. Timed test-retest variability and limit of agreement (95% confidence limit of agreement) of the modified chart are compared to the standard logMAR chart using Bland-Altman method. A comparison of the testing time was carried out using paired t-test. Results: The test-retest variability of the charts was comparable, with 95% confidence limit of the mean difference being ±0.08 for standard logMAR and ±0.10 for modified logMAR. Both the versions of modified logMAR charts produced the results which agreed well with those of the standard logMAR charts. The mean testing time required to complete the acuity measurements with the modified chart was significantly lesser compared to the standard chart (P < 0.001). Conclusion: The outcomes of the current study demonstrates that the modified logMAR chart with three optotypes offers a comparable result to the standard logMAR charts for assessing distant visual acuity in routine clinical examination set up with a much lesser testing time. Objective: To report the prevalence of myopia and its association with diabetic retinopathy in subjects with type II diabetes mellitus and compare the diabetic retinopathy status in the myopic group vs the emmetropic group. Design: Population-based study. Materials and Methods: The population-based study estimated the prevalence of myopia from 1058 subjects, who were more than 40 years old and had type II diabetes mellitus; the patients were enrolled from a cross-sectional study. Participants answered a detailed questionnaire and underwent biochemical, physical and comprehensive ocular examination which included grading of nuclear sclerosis by lens opacities classification system III (LOCS III), seven field fundus photography and ultrasonography. Diabetic retinopathy and diabetic maculopathy were graded using the Klein's classification and early treatment diabetic retinopathy study (ETDRS) criteria respectively. Results: The prevalence of mild, moderate and high myopia in type 2 diabetes was 15.9, 2.1 and 1.9% respectively. The prevalence of any myopia was found to be 19.9% in our study population. 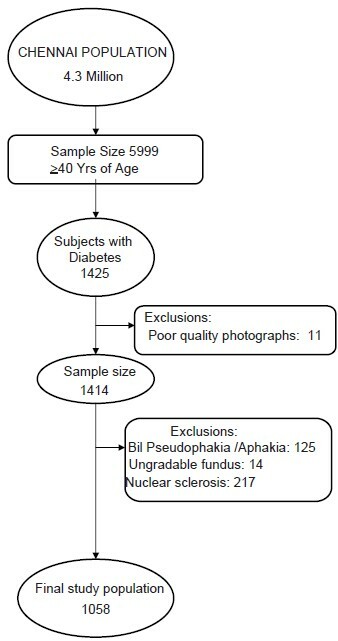 After adjusting the age, gender, duration of diabetes, hemoglobin A1c and other factors, increasing age was associated with mild and moderate myopia [OR 1.11 (95% CI 1.05 - 1.18)]. Compared to emmetropia, complete posterior vitreous detachment (CPVD) was associated with high myopia (50% Vs 12.2%, P < 0.0001). Myopia had no association with diabetic retinopathy. Conclusion: The prevalence of myopia and high myopia was found to be 19.9 and 1.9% respectively among subjects with type II diabetes. Myopia was not associated with diabetic retinopathy, thereby, suggesting the need for a longitudinal study. Purpose: To determine the correlation between fundus perimetry with Micro Perimeter 1 (MP1) and conventional automated static threshold perimetry using the Humphrey Field Analyzer (HFA) in healthy individuals and in subjects with glaucoma. Materials and Methods: In this study, we enrolled 45 eyes with glaucoma and 21 eyes of age-matched, healthy individuals. All subjects underwent complete ophthalmic examination. Differential light sensitivity was measured at 21 corresponding points in a rectangular test grid in both MP1 and HFA. Similar examination settings were used with Goldmann III stimulus, stimulus presentation time of 200 ms, and white background illumination (1.27 cd/m 2 ). Statistical analysis was done with the SPSS 14 using linear regression and independent t-test. Results: The mean light thresholds of 21 matching points in control group with MP1 and HFA were 14.97 ± 2.64 dB and 30.90 ± 2.08 dB, respectively. In subjects with glaucoma, the mean values were MP1: 11.73 ± 4.36 dB and HFA: 27.96 ± 5.41 dB. Mean difference of light thresholds among the two instruments was 15.86 ± 3.25 dB in normal subjects (P < 0.001) and 16.22 ± 2.77 dB in glaucoma subjects (P < 0.001). Pearson correlation analysis of the HFA and MP1 results for each test point location in both cases and control subjects showed significant positive correlation (controls, r = 0.439, P = 0.047; glaucoma subjects, r = 0.812, P < 0.001). There was no difference between nasal and temporal points but a slight vertical asymmetry was observed with MP1. Conclusion: There are significant and reproducible differences in the differential light threshold in MP1 and HFA in both normal and glaucoma subjects. We found a correction factor of 17.271 for comparison of MP1 with HFA. MP1 appeared to be more sensitive in predicting loss in glaucoma. 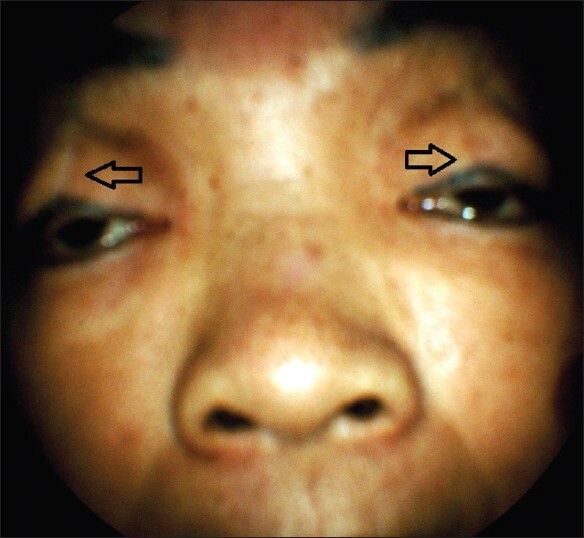 A 63-year-old man with unremarkable previous ocular history presented with bilateral symmetrical corneal ulceration along with mucopurulent conjunctivitis and dry eye 10 days after the fourth dose of intravesical Bacille Calmette-Guerin (BCG) instillation for treatment of bladder carcinoma. Slit lamp examination revealed thinning of the cornea at the base of the ulcer in both eyes. Conjunctival swab and scraping from ulcer sent for Gram and acid fast bacilli stain and culture were negative. On the basis of history, clinical examination, and laboratory investigations, we diagnosed it as bilateral immune mediated sterile corneal ulceration along with mucopurulent conjunctivitis and dry eye. He was treated with topical antibiotics, cycloplegics, cyclosporine, lubricant gel, and bandage contact lens. There was progressive stromal melting, descemetocele formation, and perforation in the inferior part of cornea in both the eyes. He was treated with pulse steroid and paramedian tarsorraphy in both eyes. The patient was subsequently lost to follow-up. We report this case to highlight this rare complication of BCG therapy, in order to improve their management protocol in patients with similar clinical profile. We could not find a similar case after thorough PubMed search. Foodborne botulism is a serious condition caused by Clostridium botulinum neurotoxin. Clinically, botulism presents as bilateral cranial nerve neuropathy and descending paralysis. We report a unique presentation of botulism to remind clinicians of this potentially fatal condition. In this observational case report initial evaluation showed only esodeviation. 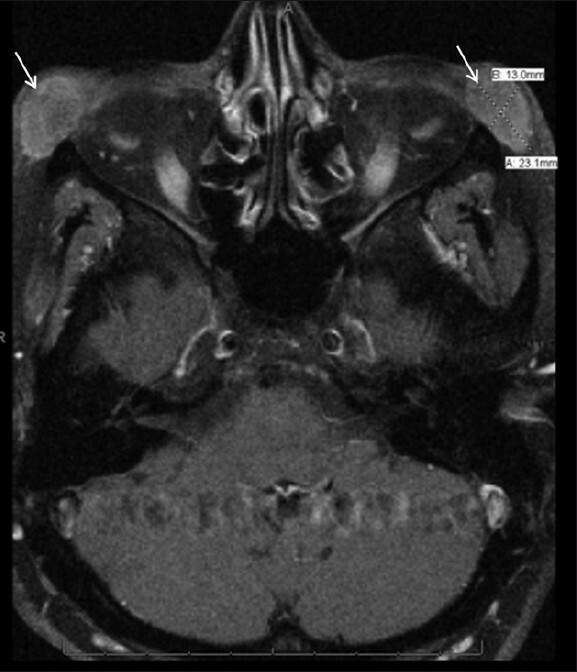 This progressed to unilateral cranial nerve six (CN VI) paresis along with systemic signs. Clinical diagnosis was made based on in-depth history and concurrent symptoms in three other patients. 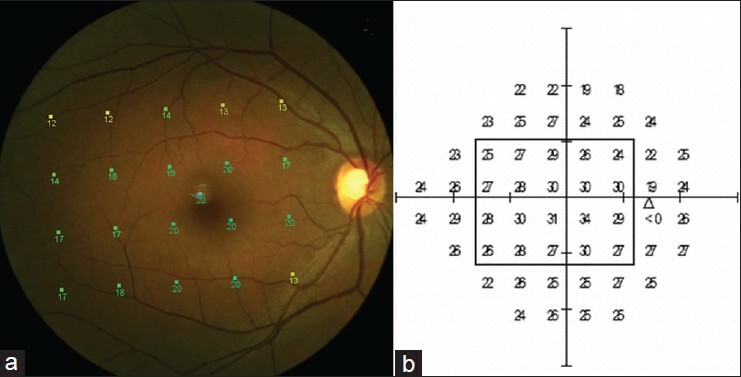 Foodborne botulism presenting as diplopia and unilateral motility deficits is rare and can represent a diagnostic and therapeutic challenge to the ophthalmologist. 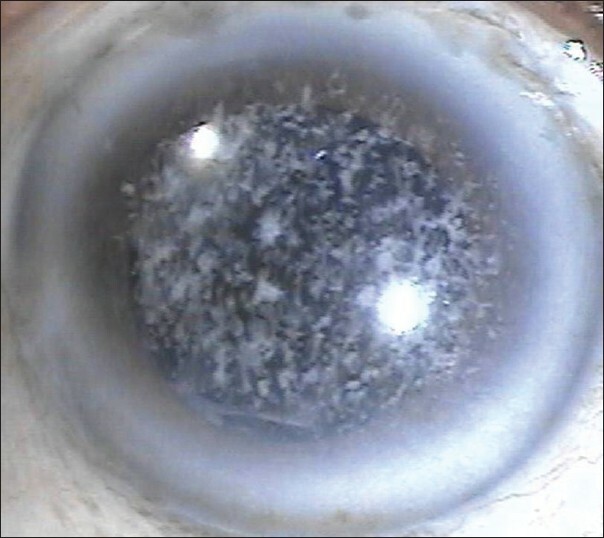 Deep anterior lamellar keratoplasty (DALK) using Dr. Anwar's big bubble technique was performed for a patient with granular dystrophy. Intraoperatively, a perforation of the Descemet's membrane (DM) was noted inferonasally. Though the surgery was completed, the donor graft appeared to have an intact endothelium, which was inadvertently left behind by the surgeon. Intraoperatively, there was a perforation of inferonasal DM and surgery was completed by inadvertently placing a donor with an intact endothelium. Postoperatively the patient presented with a complete DM detachment and a resultant double anterior chamber (DAC). In spite of two attempts at an air tamponade on the first and fifth post operative days, the DAC still persisted. Surprisingly, during the 6 th week follow up visit, there was a complete resolution of the DAC as well as total recovery of vision. This interesting case clearly exemplifies that, in spite of failed attempts at air tamponade, a DM detachment and a DAC due to DM perforation following a DALK procedure can resolve spontaneously with good visual outcome. Kearns-Sayre syndrome (KSS) belongs to the group of neuromuscular disorders known as mitochondrial encephalomyopathies. It has characteristic syndromal features, which include: chronic progressive external ophthalmoplegia, bilateral atypical pigmentary retinopathy, and cardiac conduction abnormalities. So far, only a single case has been reported where a patient with KSS had a normal retina. 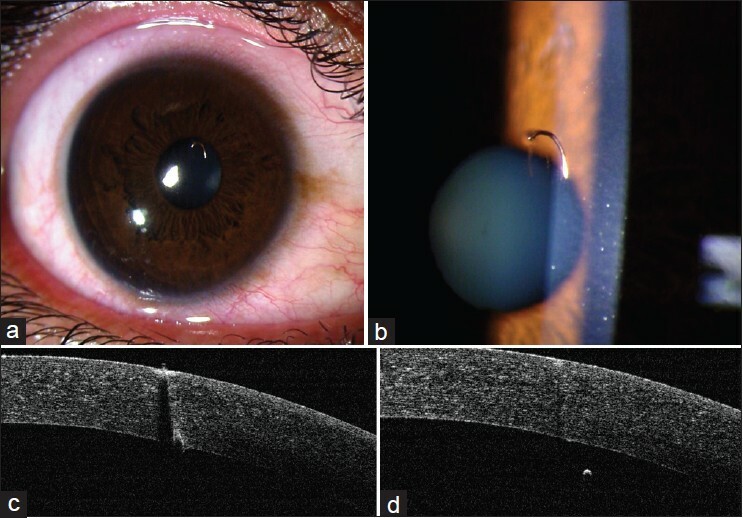 Herein, we report this extremely rare variant of KSS, which not only presented later than the normal age of presentation, but also had minimal pigmentary retinopathy. 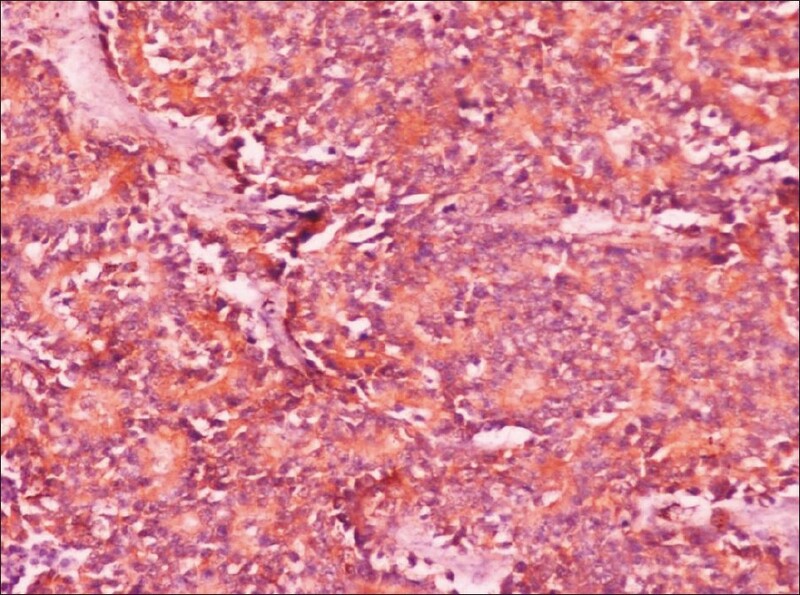 Dermoid cysts are choristomas (a mass of histologically normal tissue in an abnormal location), which originate from aberrant primordial tissue and are often evident soon after birth. It may occur anywhere in the body. Dermoid cysts account for about 3-9% of all orbital masses and 0.04-0.6% of primary orbital tumors. The frequent site of origin is the superotemporal quadrant of orbit. 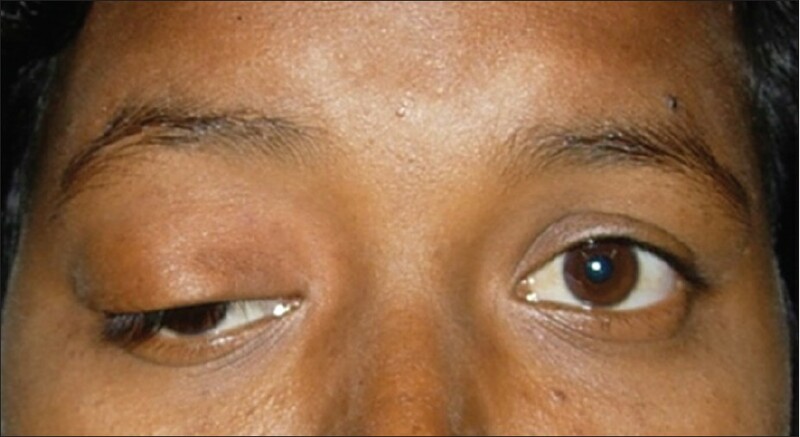 Depending on the location, size, and associated abnormalities of the cyst, the patient may have proptosis, diplopia, and restriction of eye movements. Monocular elevation deficiency (MED) is the inability to elevate one eye in abduction, adduction, or from primary position. 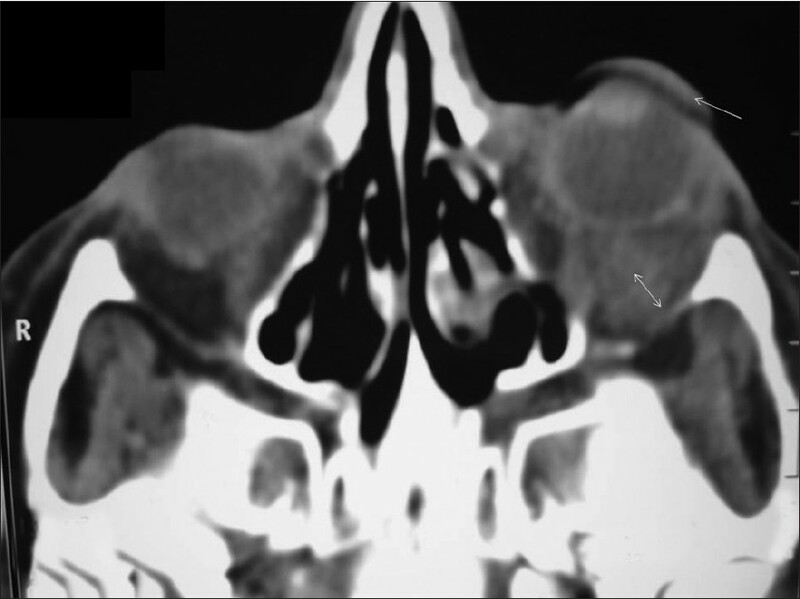 We report this case of orbital dermoid in an adult female presenting as a monocular elevation deficiency with unilateral ptosis of right eye which was investigated and managed with good results.